Momentum takes a people-centric approach to design-build. The way we see it, a building cannot be successful unless it’s truly meeting the needs of the people who will use it. 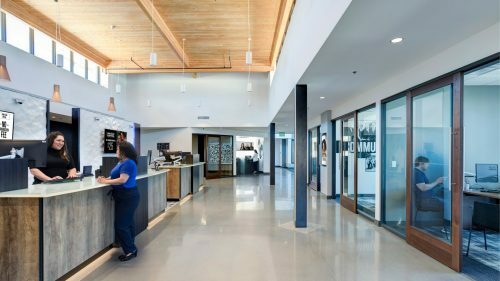 We use a strategic, collaborative approach to deliver brand-inspired buildings that reflect communities and strengthen connections, where people love to work and visit. Read more about what we do and why we believe design-build is better. We design and build spaces that strengthen connections. We ensure that key investments in infrastructure and technology will work for the people who will actually use them. The best workplaces are designed to support people. They encourage collaboration, promote wellness, and use data to establish priorities and guide decisions. This time of change is also a time of opportunity to build deeper connections with members and employees through people-centric retail branches and workplaces. Learn about emerging trends and see how others are solving the same issues you are facing. Create a workplace your employees will love.